Coffee Spots in the Arizona-based roaster/coffee shop chain, Cartel Coffee Lab. 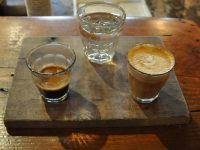 It’s fitting that I celebrate my return to Phoenix with a long overdue write up of Cartel Coffee Lab in Scottsdale. 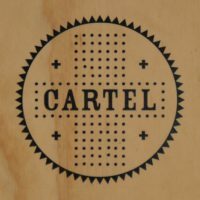 Cartel, a small roaster/coffee shop chain with its flagship roastery/coffee shop in Tempe, has been going for almost 11 years. It now has seven branches, including downtown Phoenix and at Sky Harbor airport, as well as two branches in Tucson, and another in Palm Springs over the border in California. The Scottsdale branch has been going since 2011 and I visited three times last year, never managing to write it up for a variety of reasons (usually a lack of decent photo opportunities, since it’s perpetually busy). 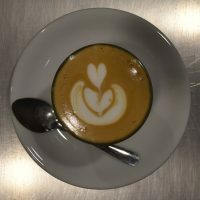 Scottsdale is similar to all the other branches when it comes to coffee, serving six seasonal single-origins, all roasted in-house, one of which is decaf. Naturally, all the beans are available to buy. 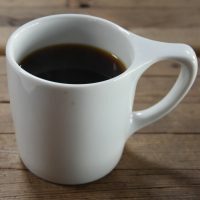 One (the top of the list) is always available as espresso, while there’s also a daily bulk-brew, with all the beans available as pour-over through the Chemex (8oz or 16oz), Cartel having stopped offering Aeropress/V60 at the end of 2018. There’s a range of cakes if you’re hungry and, in this branch, craft beer and Arizona wine on tap. Along with Press Coffee, a chance discovery on my first visit to Phoenix, the other big name in Phoenix coffee is Cartel Coffee Lab. 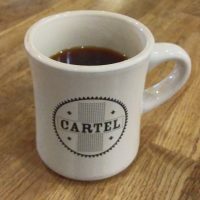 Another roaster/coffee shop chain, Cartel has six branches, including one at Sky Harbor Airport (one of my favourite airports), another in downtown Phoenix and two in Tucson. In a departure from the Coffee Spot norm, my introduction to Cartel was visiting its original branch, the coffee shop/roastery, in downtown Tempe. A large, sprawling spot, Cartel consists of multiple, connected spaces, which betrays its roots, since Cartel started in just one small part of its current home, slowly expanding to incorporate the additional spaces over the years. Further expansion is in the pipeline: the roastery (currently along the left-hand side in the front part of the store) will soon be shifted into the adjacent building at the back of the store. Cartel, which never roasts blends, has six single-origins, including a decaf. All are available as filter through Aeropress, V60, Clever Dripper and Chemex, while one (plus the decaf) is available as espresso. There’s also a daily option on bulk-brew, cold brew and, if you’re hungry, a small selection of cake. If you don’t fancy coffee, there is a small tea selection too.